This Turkey Bacon Grilled Cheese Recipe is going to make you a cheese lover if you aren’t one yet. 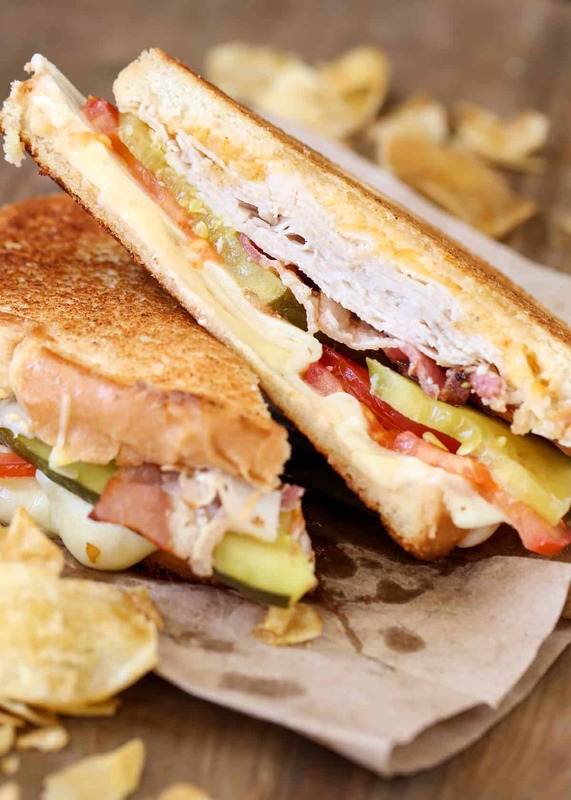 The sandwich is crispy and flavorful on the outside while the inside oozes out with loaded cheese, turkey and bacon. The perfect combination! 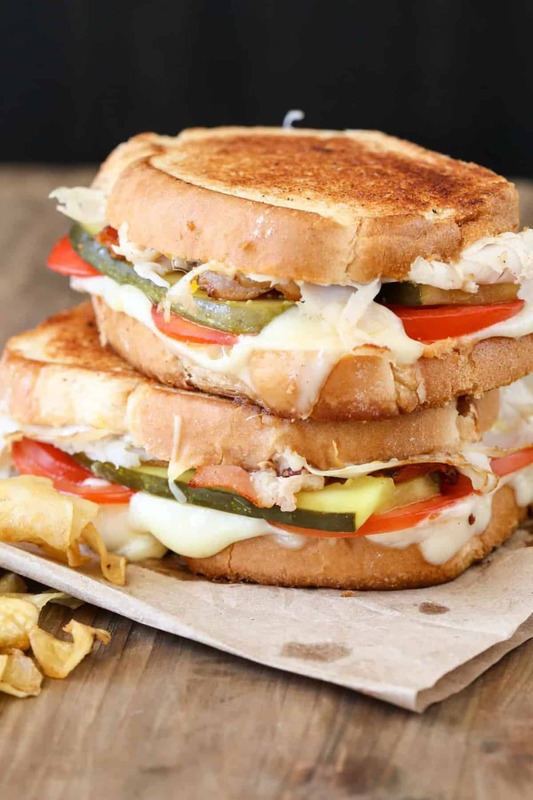 You are going to label this sandwich with The best-grilled cheese recipe once you try it! Not only is the face of the sandwich so flavorful from the garlic butter spread, but the chipotle spread paired with turkey, bacon, tomatoes and pickles take the sandwich over the top. Oh and the cheese, loads and loads of cheese! I never imagined pickle slices can add so much flavor to a grilled cheese sandwich! It’s like an unexpected “secret ingredient”. TIP: The chipotle sauce is optional. It gives the sandwich a little kick! You can also serve it as a side to dip the sandwich or omit it completely. Grilled cheese is so easy to make. Usually, a grilled cheese consists of your favorite cheese melted between slices of your favorite bread. This is a full-blown loaded sandwich! Pick a good cheese that will melt. Add your favorite deli meat. Spread tops of sandwich with butter for a crispy sandwich. Cook. Watch the cheese melt. Be mesmerized! You can use your favorite cheese that melts well when heated. Cheeses like American, Provolone, Swiss, Muenster and Colby Jack are all great. You can either use shredded cheese or sliced cheese. I used both in this recipe. You want to use a good quality white bread. I typically like to purchase a bread loaf and hand-slice the bread. A good Italian loaf, a ciabatta, good sourdough or a French bread loaf are all great once grilled. How to make a grilled cheese sandwich on the grill? 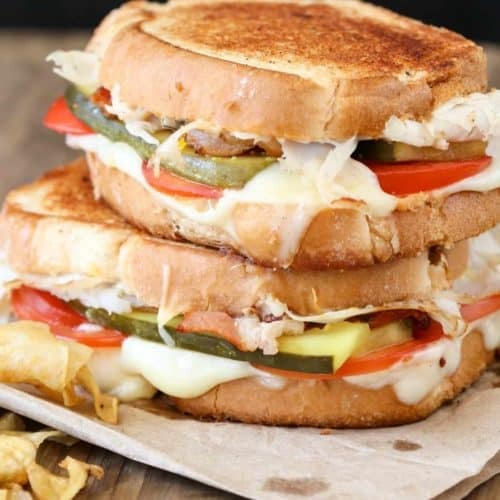 With summer in full swing, make this grilled cheese sandwich on the grill! I just add foil before adding the sandwich so the heat would not burn the bread. Continue with the cooking. Bringing “grill” back into Grilled Cheese;)! I hope you LOVED this recipe. Pretty please don’t forget to comment below! Those are so helpful and appreciated. 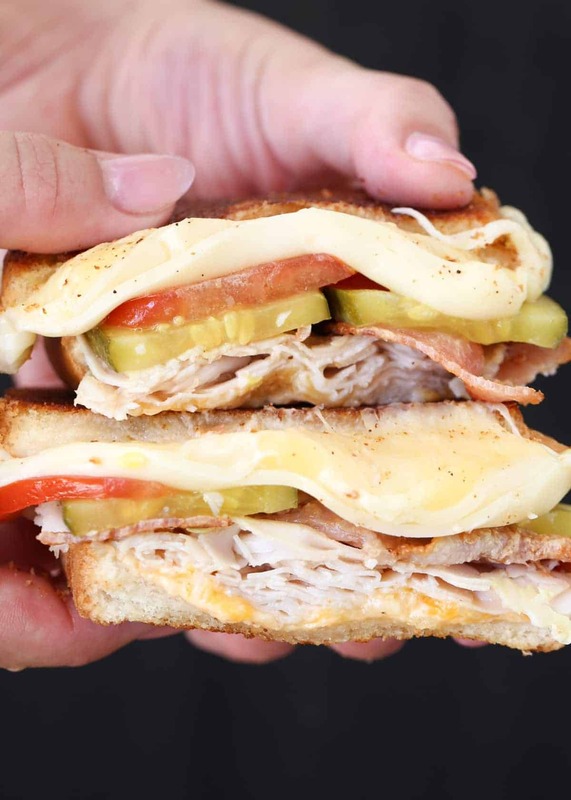 This Turkey Bacon Grilled Cheese Recipe is going to make you a cheese lover if you aren't one yet. 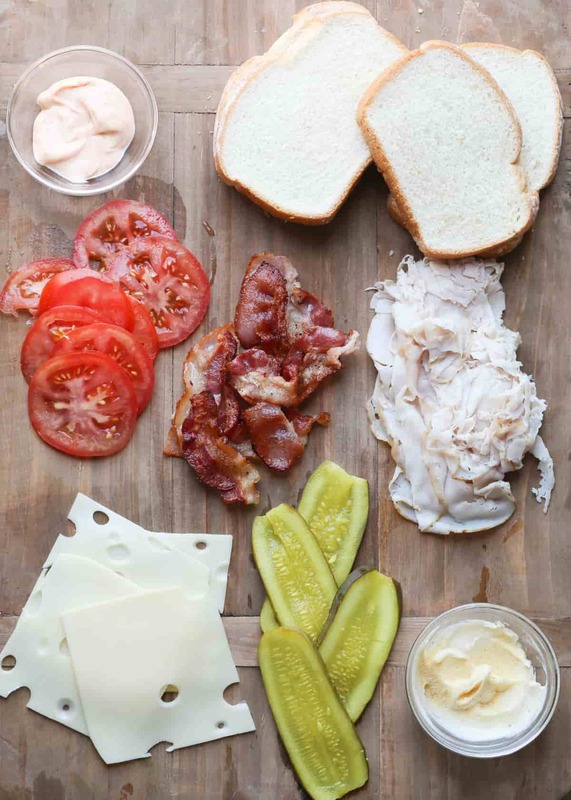 The sandwich is crispy and flavorful on the outside while the inside oozes out with loaded cheese, turkey and bacon. The perfect combination! Combine ingredients for the sauce. Spread sauce on all four sides of bread slices (the insides). 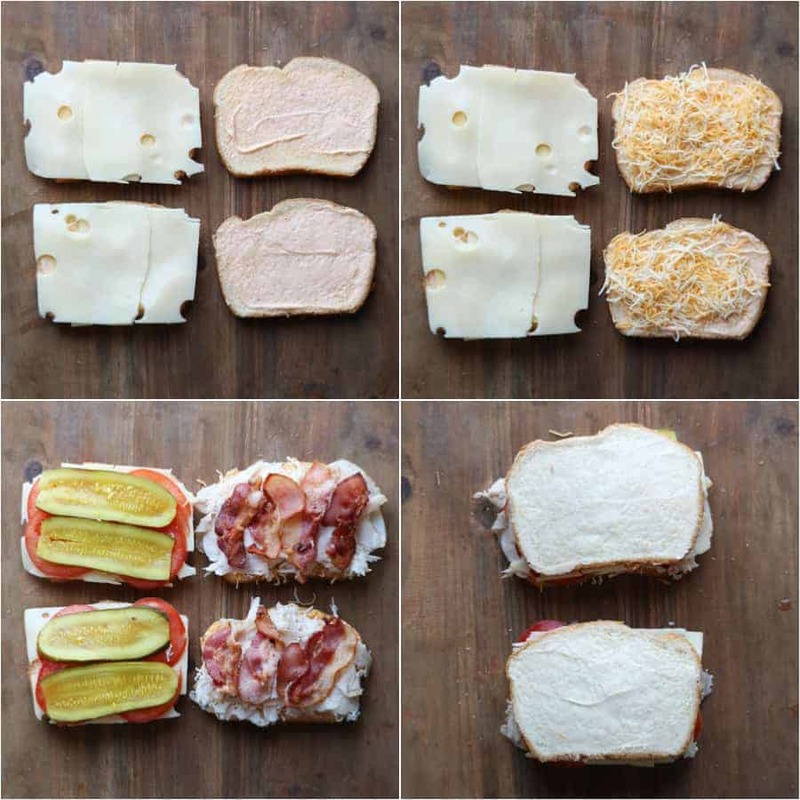 Add cheese to bread slices. Add remaining ingredients. Combine butter and garlic powder. Spread on all faces of sandwiches. Heat a large non-stick skillet. Add sandwiches. Cook on medium/high heat until cheese completely melts and face of the sandwich is crispy. About 8-10 minutes. What type of pickles are those? Hi, Lynn! You can use your favorite pickles. 🙂 Enjoy! how come i cant pin this recipe? i don’t see a pin button anywhere. lol. Thanks so much, Veronica. You’re so sweet!